With forest company’s industry wide faced with fibre accessibility challenges, the name of the game today is supply chain optimization. A technology company based in Vancouver believes the solution is in forestry-specific data collection and analytics. Big data — a buzzword for the storage and analysis of large, complex data sets from multiple sources — has taken most industries by storm. Technologies such as drones, LIDAR, radio-frequency identification, and various equipment sensors allow companies to collect seemingly endless amounts of data, but it’s the practical application that is somewhat elusive to the forest sector. Mike Wilcox, co-founder of FYBR Solutions along with Patrick Crawford, says the end goal of all data and analysis in the forest sector is to better understand and optimize supply and production. “We specialize in the use of drones, but they are just the tip of the iceberg,” Wilcox says. FYBR began in 2014 as Spire Aerobotics Inc. — a drone company for the natural resources sector. The company has since rebranded as FYBR Solutions to reflect what the team had quickly learned: In order for their drones to solve real-world problems, they needed to provide a turnkey solution for just one industry. More >>. Innovations, uses and implementation of drone related images and data in forest resource assessment will be an integral part of this year’s ForestTECH 2018 series being run in November. Presentations on two relatively new entrants to the forestry scene, a 100kg pilotless helicopter that has been working on some forestry trials in New Zealand along with a new vertical take-off and landing UAV (think of the opportunities here in a forestry environment with a closed canopy) that is being introduced to this region are being made. 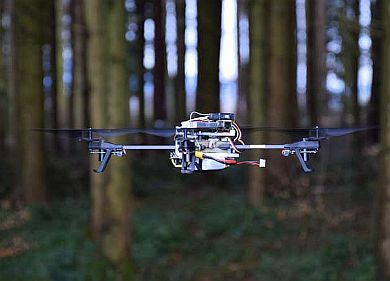 In addition, early results from in-forest drones using LiDAR, electro-optic, thermal infrared and hyperspectral sensors in SA forests and an update on the development of a system to replace iOS location services with drone co-ordinates in a forest company’s mapping system are going to be outlined to local resource managers and inventory foresters. Full details on the programmes for both New Zealand (14-15 November) and Australia (20-21 November) along with workshops can be seen on the event website; www.foresttech.events.